There are many days to enjoy and remember in the merry-month-of-May: May Day, Kentucky Derby, Mother’s Day, Armed Forces Day, Memorial Day, even National Burger Day. But, as Spring starts to appear and the days get longer there is a day that we as Norwegian’s and Norwegian American’s look forward to and prize and that is syttende mai (17th of May), Nasjonaldagen (The National Day) or Grunnlovsdagen (The Constitution Day). No matter what name you use, what title you give the day, this is the day to fly the flag and make a lot of noise and shouting “Hurra!”. We look forward to flying our Norwegian Flag, singing “Ja vi elsker dette landet”, wearing our bunads, ribbons of the red, white and blue of the Norwegian Flag, enjoying some traditional foods, marching in parades, and generally celebrating the day. 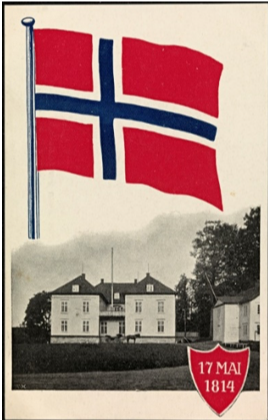 For just a little history of the day, the Constitution of Norway was signed at Eidsvoll on May 17 in the year 1814. The constitution declared Norway to be an independent kingdom in an attempt to avoid being ceded to Sweden after Denmark–Norway‘s devastating defeat in the Napoleonic Wars. We can thank the poet Henrik Wergeland with making May 17th a celebratory day. He is credited with giving the first public address on behalf of the national day, when there was a Royal decree forbidding celebrations. Now, here we are 205 years after the signing, and 114 years since the union with Sweden was dissolved. So, on May 17 be proud to fly that Norwegian flag and however you celebrate the day know there are thousands, rather hundreds of thousands, across the world who are flying their Norwegian Flags and enjoying the festivities also. One can add that the day should be regarded as an expression of thankfulness, on behalf of the old values of freedom, equality and brotherhood, the ideological basis for the constitution, and also on behalf of the circumstances that led up to the constitution. So Gratulerer med dagen and Hipp Hipp Hurra !! !